Tentsile wants you to throw this tent in the lake. 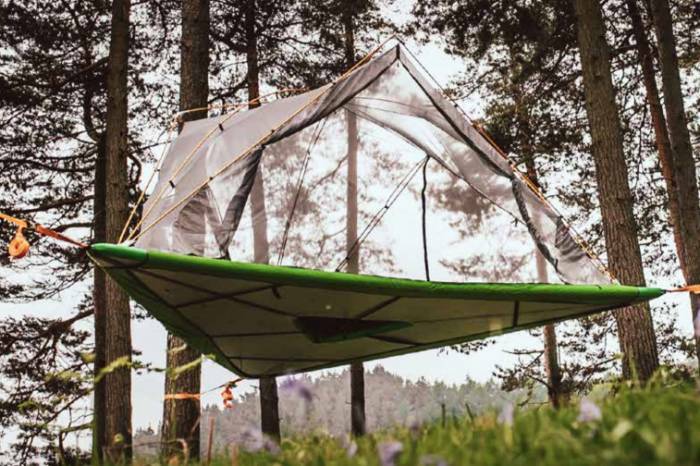 Tentsile brought out our inner tree-fort-loving child when it first launched its triangular hanging tent years ago. 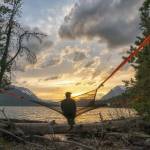 It provided the ease and comfort of a hammock with the space and coverage of a traditional ground tent. The secret password to enter, though, was totally up to us. Now, the U.K.-based brand thinks there’s an even more fun way to camp. 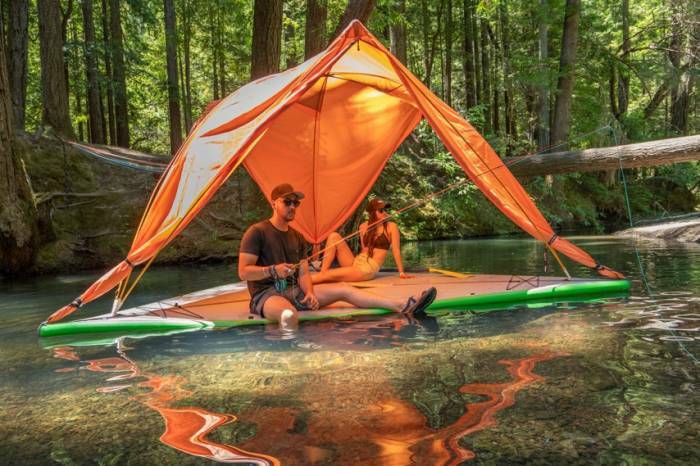 Tentsile just announced its Universe tent, a “three-element” shelter that works as a ground tent, a suspended tree tent, and a floating, pontoon-style tent. You read that right: Now you can have a secret camping treehouse that also floats on the water! For those unfamiliar with Tentsile tents, we’ve tested them and can attest that they’re loads of fun and pretty comfortable. Because they come with a higher price tag than traditional ground tents and a notable weight penalty, we’d say they’re primarily an add-on to car camping adventures. 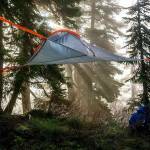 The Tentsile Universe marks the brand’s largest offering to date. It accommodates up to five adults (880 pounds) plus gear. It has 100 square feet of floor space. With the rainfly, it offers 195 square feet of covered space and three vestibules. Plus, the Universe has more than 5 feet of interior headspace, meaning it might actually be bigger than your backyard treehouse as a kid. Unlike previous Tentsile tents, the brand claims the Universe is suitable as a four-season shelter with an insulated floor. So, as you might expect, the entire floor holds air (more on that in a sec). Like its predecessors, the Universe carries Tentsile’s trademark triangular shape and uses three ratchet straps for hanging. 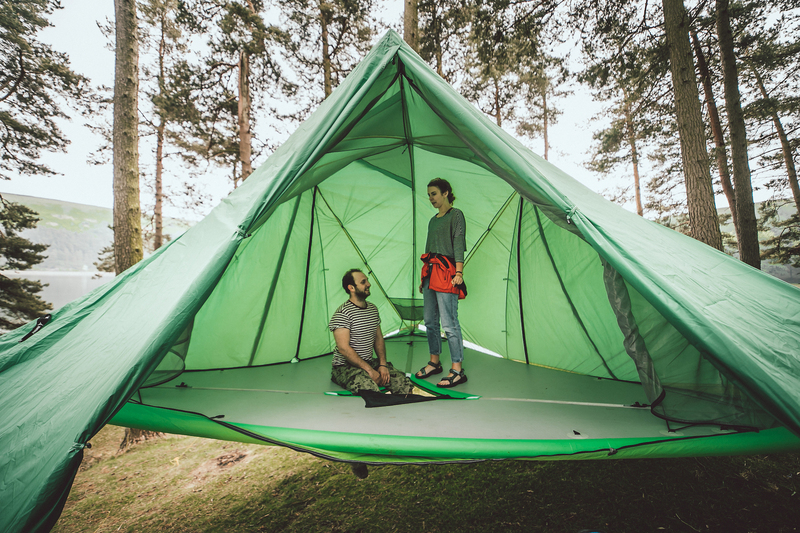 Meanwhile, removable tent poles support bug-stopping mesh and a detachable rainfly. Plus, the Universe has multiple entry options, with doors along the wall or through a trapdoor in the center of the floor — ideal for password-restricted access. The big hullabaloo is the Universe’s seaworthiness. According to Tentsile, users can covert the Universe into “an incredibly stable three-person SUP-style raft.” Again, the max load is 880 pounds, and rafters must inflate the Universe floor to 15 psi before setting sail. BIG, BRIGHT, FLASHING WARNING: Do NOT sleep in the Universe when it’s on the water. It ought to go without saying, but in addition to being super creepy, sleeping on an open raft on a dark lake in the woods isn’t safe. While you’re awake, however, it could be a lot of fun. With the vestibules rolled up, the rainfly attaches to the poles to create a covered tri-pontoon. Tentsile doesn’t sell paddles, so navigating the Universe is on you — unless you’re willing to go literally wherever the wind takes you. Also, looking at some of the brand’s marketing, it looks like you could try fishing through the trapdoor or out the side while you float. But we’ll have to test that out after we get a chance to see the Universe up close at Outdoor Retailer this month. 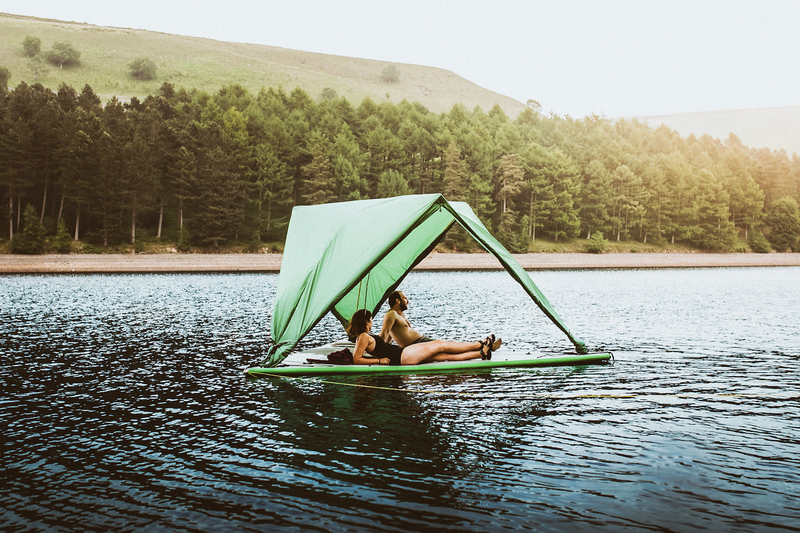 If a floating four-season tent-raft that can hang in the trees has you as excited as we are, you’ll have your chance to buy one when it hits retailers in February 2019. 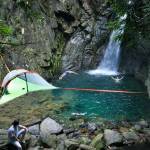 That should also give you time to start saving, as the Tentsile Universe will retail for $1,999. Until then, you can bet we’ll test one for a full review — by land, sea, and air.